Zonisamide is an antiseizure drug chemically classified as a sulfonamide and unrelated to other antiseizure agents. The active ingredient is zonisamide, 1,2-benzisoxazole-3-methanesulfonamide. The molecular formula is C8H8N2O3S with a molecular weight of 212.23. Zonisamide is a white powder, pKa = 10.2, and is moderately soluble in water (0.8 mg/mL) and 0.1 N HCl (0.5 mg/mL). Zonisamide is supplied for oral administration as capsules containing 25 mg, 50 mg or 100 mg zonisamide. Each capsule contains the labeled amount of zonisamide plus the following inactive ingredients: microcrystalline cellulose, hydrogenated vegetable oil, gelatin, and titanium dioxide. 50 mg: Black iron oxide. 100 mg: FD&C Blue #1 and FD&C Red #40. The imprinting ink contains black iron oxide, shellac glaze, propylene glycol and also contains either FD&C Blue No. 2, FD&C Red No. 40, FD&C Blue No. 1 and D&C Yellow No.10 or strong ammonia solution and potassium hydroxide. Zonisamide may produce these effects through action at sodium and calcium channels. In vitro pharmacological studies suggest that zonisamide blocks sodium channels and reduces voltage-dependent, transient inward currents (T-type Ca2+ currents), consequently stabilizing neuronal membranes and suppressing neuronal hypersynchronization. In vitro binding studies have demonstrated that zonisamide binds to the GABA/benzodiazepine receptor ionophore complex in an allosteric fashion which does not produce changes in chloride flux. Other in vitro studies have demonstrated that zonisamide (10 to 30 mcg/mL) suppresses synaptically-driven electrical activity without affecting postsynaptic GABA or glutamate responses (cultured mouse spinal cord neurons) or neuronal or glial uptake of [3H]-GABA (rat hippocampal slices). Thus, zonisamide does not appear to potentiate the synaptic activity of GABA. In vivo microdialysis studies demonstrated that zonisamide facilitates both dopaminergic and serotonergic neurotransmission. The apparent volume of distribution (V/F) of zonisamide is about 1.45 L/kg following a 400 mg oral dose. Zonisamide, at concentrations of 1 to 7 mcg/mL, is approximately 40% bound to human plasma proteins. Protein binding of zonisamide is unaffected in the presence of therapeutic concentrations of phenytoin, phenobarbital or carbamazepine. Following oral administration of 14C-zonisamide to healthy volunteers, only zonisamide was detected in plasma. Zonisamide is excreted primarily in urine as parent drug and as the glucuronide of a metabolite. Following multiple dosing, 62% of the 14C dose was recovered in the urine, with 3% in the feces by day 10. Zonisamide undergoes acetylation to form N-acetyl zonisamide and reduction to form the open ring metabolite, 2â€“sulfamoylacetyl phenol (SMAP). Of the excreted dose, 35% was recovered as zonisamide, 15% as N-acetyl zonisamide, and 50% as the glucuronide of SMAP. Reduction of zonisamide to SMAP is mediated by cytochrome P450 isozyme 3A4 (CYP3A4). Zonisamide does not induce its own metabolism. Plasma clearance of zonisamide is approximately 0.3 to 0.35 mL/min/kg in patients not receiving enzyme-inducing antiepilepsy drugs (AEDs). The clearance of zonisamide is increased to 0.5 mL/min/kg in patients concurrently on enzyme-inducing AEDs. Single 300 mg zonisamide doses were administered to three groups of volunteers. Group 1 was a healthy group with a creatinine clearance ranging from 70 to 152 mL/min. Group 2 and Group 3 had creatinine clearances ranging from 14.5 to 59 mL/min and 10 to 20 mL/min, respectively. Zonisamide renal clearance decreased with decreasing renal function (3.42, 2.5, 2.23 mL/min, respectively). Marked renal impairment (creatinine clearance < 20 mL/min) was associated with an increase in zonisamide AUC of 35% (see DOSAGE AND ADMINISTRATION section). Concurrent medication with drugs that either induce or inhibit CYP3A4 may alter serum concentrations of zonisamide. Concomitant administration of phenytoin and carbamazepine increases zonisamide plasma clearance from 0.3 to 0.35 mL/min/kg to 0.35 to 0.5 mL/min/kg. The half-life of zonisamide is decreased to 27 hours by phenytoin, to 38 hours by phenobarbital and carbamazepine, and to 46 hours by valproate. Plasma protein binding of phenytoin and carbamazepine was not affected by zonisamide administration (see PRECAUTIONS, Drug Interactions subsection). The effectiveness of zonisamide as adjunctive therapy (added to other antiepilepsy drugs) has been established in three multicenter, placebo-controlled, double blind, 3-month clinical trials (two domestic, one European) in 499 patients with refractory partial onset seizures with or without secondary generalization. Each patient had a history of at least four partial onset seizures per month in spite of receiving one or two antiepilepsy drugs at therapeutic concentrations. The 499 patients (209 women, 290 men) ranged in age from 13 to 68 years with a mean age of about 35 years. In the two US studies, over 80% of patients were Caucasian; 100% of patients in the European study were Caucasian. Zonisamide or placebo was added to the existing therapy. The primary measure of effectiveness was median percent reduction from baseline in partial seizure frequency. The secondary measure was proportion of patients achieving a 50% or greater seizure reduction from baseline (responders). The results described below are for all partial seizures in the intent-to-treat populations. In the first study (n = 203), all patients had a 1-month baseline observation period, then received placebo or zonisamide in one of two dose escalation regimens; either 1) 100 mg/day for five weeks, 200 mg/day for one week, 300 mg/day for one week, and then 400 mg/day for five weeks; or 2) 100 mg/day for one week, followed by 200 mg/day for five weeks, then 300 mg/day for one week, then 400 mg/day for five weeks. This design allowed a 100 mg vs. placebo comparison over weeks 1 to 5, and a 200 mg vs. placebo comparison over weeks 2 to 6; the primary comparison was 400 mg (both escalation groups combined) vs. placebo over weeks 8 to 12. The total daily dose was given as twice a day dosing. Statistically significant treatment differences favoring zonisamide were seen for doses of 100, 200, and 400 mg/day. Zonisamide is contraindicated in patients who have demonstrated hypersensitivity to sulfonamides or zonisamide. Consideration should be given to discontinuing zonisamide in patients who develop an otherwise unexplained rash. If the drug is not discontinued, patients should be observed frequently. Seven deaths from severe rash [i.e. Stevens-Johnson syndrome (SJS) and toxic epidermal necrolysis (TEN)] were reported in the first 11 years of marketing in Japan. All of the patients were receiving other drugs in addition to zonisamide. In post-marketing experience from Japan, a total of 49 cases of SJS or TEN have been reported, a reporting rate of 46 per million patient-years of exposure. Although this rate is greater than background, it is probably an underestimate of the true incidence because of under-reporting. There were no confirmed cases of SJS or TEN in the US, European, or Japanese development programs. 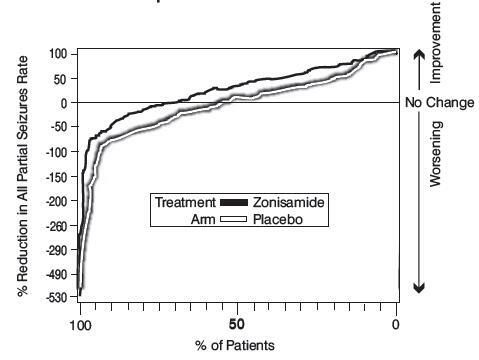 In the US and European randomized controlled trials, 6 of 269 (2.2%) zonisamide patients discontinued treatment because of rash compared to none on placebo. Across all trials during the US and European development, rash that led to discontinuation of zonisamide was reported in 1.4% of patients (12 events per 1000 patient-years of exposure). During Japanese development, serious rash or rash that led to study drug discontinuation was reported in 2% of patients (27.8 events per 1000 patient years). Rash usually occurred early in treatment, with 85% reported within 16 weeks in the US and European studies and 90% reported within two weeks in the Japanese studies. There was no apparent relationship of dose to the occurrence of rash. Antiepileptic drugs (AEDs), including zonisamide, increase the risk of suicidal thoughts or behavior in patients taking these drugs for any indication. Patients treated with any AED for any indication should be monitored for the emergence or worsening of depression, suicidal thoughts or behavior, and/or any unusual changes in mood or behavior. Anyone considering prescribing zonisamide or any other AED must balance the risk of suicidal thoughts or behavior with the risk of untreated illness. Epilepsy and many other illnesses for which AEDs are prescribed are themselves associated with morbidity and mortality and an increased risk of suicidal thoughts and behavior. Should suicidal thoughts and behavior emerge during treatment, the prescriber needs to consider whether the emergence of these symptoms in any given patient may be related to the illness being treated. Zonisamide causes hyperchloremic, non-anion gap, metabolic acidosis (i.e., decreased serum bicarbonate below the normal reference range in the absence of chronic respiratory alkalosis) (see PRECAUTIONS, Laboratory Tests subsection). This metabolic acidosis is caused by renal bicarbonate loss due to the inhibitory effect of zonisamide on carbonic anhydrase. Some manifestations of acute or chronic metabolic acidosis include hyperventilation, nonspecific symptoms such as fatigue and anorexia, or more severe sequelae including cardiac arrhythmias or stupor. Chronic, untreated, metabolic acidosis may increase the risk for nephrolithiasis or nephrocalcinosis. Nephrolithiasis has been observed in the clinical development program in 4 % of adults treated with zonisamide, has also been detected by renal ultrasound in 8 % of pediatric treated patients who had at least one ultrasound prospectively collected, and was reported as an adverse event in 3 % (4/133) of pediatric patients (see PRECAUTIONS, Kidney Stones subsection). In two controlled studies in adults, the incidence of a persistent treatment-emergent decrease in serum bicarbonate to less than 20 mEq/L (observed at 2 or more consecutive visits or the final visit) was dose-related at relatively low zonisamide doses. In the monotherapy trial of epilepsy, the incidence of a persistent treatment-emergent decrease in serum bicarbonate was 21% for daily zonisamide doses of 25 mg or 100 mg, and was 43% at a daily dose of 300 mg. In a placebo-controlled trial for prophylaxis of migraine, the incidence of a persistent treatment-emergent decrease in serum bicarbonate was 7% for placebo, 29% for 150 mg daily, and 34% for 300 mg daily. The incidence of persistent markedly abnormally low serum bicarbonate (decrease to less than 17 mEq/L and more than 5 mEq/L from a pretreatment value of at least 20 mEq/L in these controlled trials was 2% or less. In the pediatric study, the incidence of persistent, treatment-emergent decreases in serum bicarbonate to levels less than 20 mEq/L was 52% at doses up to 100 mg daily, was 90% for a wide range of doses up to 600 mg daily, and generally appeared to increase with higher doses. The incidence of a persistent markedly abnormally low serum bicarbonate value was 4 % at doses up to 100 mg daily, was 18% for a wide range of doses up to 600 mg daily, and generally appeared to increase with higher doses. Some patients experienced moderately severe serum bicarbonate decrements down to a level as low as 10 mEq/L. The relatively high frequencies of varying severities of metabolic acidosis observed in this study of pediatric patients (compared to the frequency and severity observed in various clinical trial development programs in adults) suggest that pediatric patients may be more likely to develop metabolic acidosis than adults. Women of child bearing potential who are given zonisamide should be advised to use effective contraception. Zonisamide was teratogenic in mice, rats, and dogs and embryolethal in monkeys when administered during the period of organogenesis. A variety of fetal abnormalities, including cardiovascular defects, and embryo-fetal deaths occurred at maternal plasma levels similar to or lower than therapeutic levels in humans. These findings suggest that the use of zonisamide during pregnancy in humans may present a significant risk to the fetus (see PRECAUTIONS, Pregnancy subsection). Zonisamide should be used during pregnancy only if the potential benefit justifies the potential risk to the fetus. In placebo-controlled trials, 2.2% of patients discontinued zonisamide or were hospitalized for depression compared to 0.4% of placebo patients. Among all epilepsy patients treated with zonisamide, 1.4% were discontinued and 1% were hospitalized because of reported depression or suicide attempts. In placebo-controlled trials, 2.2% of patients discontinued zonisamide or were hospitalized due to psychosis or psychosis-related symptoms compared to none of the placebo patients. Among all epilepsy patients treated with zonisamide, 0.9% were discontinued and 1.4% were hospitalized because of reported psychosis or related symptoms. Somnolence is commonly reported, especially at higher doses of zonisamide (see WARNINGS: Cognitive/Neuropsychiatric Adverse Events subsection). Zonisamide is metabolized by the liver and eliminated by the kidneys; caution should therefore be exercised when administering zonisamide to patients with hepatic and renal dysfunction (see CLINICAL PHARMACOLOGY, Special Populations subsection). Among 991 patients treated during the development of zonisamide, 40 patients (4%) with epilepsy receiving zonisamide developed clinically possible or confirmed kidney stones (e.g. clinical symptomatology, sonography, etc. ), a rate of 34 per 1000 patient-years of exposure (40 patients with 1168 years of exposure). Of these, 12 were symptomatic, and 28 were described as possible kidney stones based on sonographic detection. In nine patients, the diagnosis was confirmed by a passage of a stone or by a definitive sonographic finding. The rate of occurrence of kidney stones was 28.7 per 1000 patient-years of exposure in the first six months, 62.6 per 1000 patient-years of exposure between 6 and 12 months, and 24.3 per 1000 patient-years of exposure after 12 months of use. There are no normative sonographic data available for either the general population or patients with epilepsy. Although the clinical significance of the sonographic findings may not be certain, the development of nephrolithiasis may be related to metabolic acidosis (see WARNINGS, Metabolic Acidosis subsection). The analyzed stones were composed of calcium or urate salts. In general, increasing fluid intake and urine output can help reduce the risk of stone formation, particularly in those with predisposing risk factors. It is unknown, however, whether these measures will reduce the risk of stone formation in patients treated with zonisamide. Although not approved in pediatric patients, sonographic findings consistent with nephrolithiasis were also detected in 8 % of a subset of zonisamide treated pediatric patients who had at least one renal ultrasound prospectively performed in a clinical development program investigating open-label treatment. The incidence of kidney stone as an adverse event was 3 % (see WARNINGS, Metabolic Acidosis subsection). In several clinical studies, zonisamide was associated with a statistically significant 8% mean increase from baseline of serum creatinine and blood urea nitrogen (BUN) compared to essentially no change in the placebo patients. The increase appeared to persist over time but was not progressive; this has been interpreted as an effect on glomerular filtration rate (GFR). There were no episodes of unexplained acute renal failure in clinical development in the US, Europe, or Japan. The decrease in GFR appeared within the first 4 weeks of treatment. In a 30-day study, the GFR returned to baseline within 2 to 3 weeks of drug discontinuation. There is no information about reversibility, after drug discontinuation, of the effects on GFR after long-term use. Zonisamide should be discontinued in patients who develop acute renal failure or a clinically significant sustained increase in the creatinine/BUN concentration. Zonisamide should not be used in patients with renal failure (estimated GFR < 50 mL/min) as there has been insufficient experience concerning drug dosing and toxicity. During the development of zonisamide capsules, nine sudden unexplained deaths occurred among 991 patients with epilepsy receiving zonisamide for whom accurate exposure data are available. This represents an incidence of 7.7 deaths per 1000 patient years. Although this rate exceeds that expected in a healthy population, it is within the range of estimates for the incidence of sudden unexplained deaths in patients with refractory epilepsy not receiving zonisamide (ranging from 0.5 per 1000 patient-years for the general population of patients with epilepsy, to 2 to 5 per 1000 patient-years for patients with refractory epilepsy; higher incidences range from 9 to 15 per 1000 patient-years among surgical candidates and surgical failures). Some of the deaths could represent seizure-related deaths in which the seizure was not observed. Estimates of the incidence of treatment emergent status epilepticus in zonisamide-treated patients are difficult because a standard definition was not employed. Nonetheless, in controlled trials, 1.1% of patients treated with zonisamide had an event labeled as status epilepticus compared to none of the patients treated with placebo. Among patients treated with zonisamide across all epilepsy studies (controlled and uncontrolled), 1% of patients had an event reported as status epilepticus. Zonisamide may produce drowsiness, especially at higher doses. Patients should be advised not to drive a car or operate other complex machinery until they have gained experience on zonisamide sufficient to determine whether it affects their performance. Because of the potential of zonisamide to cause CNS depression, as well as other cognitive and/or neuropsychiatric adverse events, zonisamide should be used with caution if used in combination with alcohol or other CNS depressants. Suicidal Thinking and Behavior - Patients, their caregivers, and families should be counseled that AEDs, including zonisamide, may increase the risk of suicidal thoughts and behavior and should be advised of the need to be alert for the emergence or worsening of symptoms of depression, any unusual changes in mood or behavior, or the emergence of suicidal thoughts, behavior, or thoughts about self-harm. Behaviors of concern should be reported immediately to healthcare providers. As with other AEDs, patients should contact their physician if they intend to become pregnant or are pregnant during zonisamide therapy. Patients should notify their physician if they intend to breast-feed or are breast-feeding an infant. Drugs that induce liver enzymes increase the metabolism and clearance of zonisamide and decrease its half-life. The half-life of zonisamide following a 400 mg dose in patients concurrently on enzyme-inducing AEDs such as phenytoin, carbamazepine, or phenobarbital was between 27 and 38 hours; the half-life of zonisamide in patients concurrently on the non-enzyme inducing AED, valproate, was 46 hours. Concurrent medication with drugs that either induce or inhibit CYP3A4 would be expected to alter serum concentrations of zonisamide. Concomitant administration of zonisamide and alcohol or other CNS depressant drugs has not been evaluated in clinical studies. Because of the potential of zonisamide to cause CNS depression, as well as other cognitive and/or neuropsychiatric adverse events, zonisamide should be used with caution if used in combination with alcohol or other CNS depressants. Concomitant use of zonisamide, a carbonic anhydrase inhibitor, with any other carbonic anhydrase inhibitor (e.g., topiramate, acetazolamide or dichlorphenamide), may increase the severity of metabolic acidosis and may also increase the risk of kidney stone formation. Therefore, if zonisamide is given concomitantly with another carbonic anhydrase inhibitor, the patient should be monitored for the appearance or worsening of metabolic acidosis (see CLINICAL PHARMACOLOGY, Interactions of Zonisamide with Other Carbonic Anhydrase Inhibitors subsection). Pregnancy Category C (see WARNINGS, Teratogenicity subsection): Zonisamide may cause serious adverse fetal effects, based on clinical and nonclinical data. Zonisamide was teratogenic in multiple animal species. To provide information regarding the effects of in utero exposure to zonisamide, physicians are advised to recommend that pregnant patients taking zonisamide capsules enroll in the NAAED Pregnancy Registry. This can be done by calling the toll free number 1-888-233-2334, and must be done by patients themselves. Information on the registry can also be found at the website http://www.aedpregnancyregistry.org/. The effects of zonisamide on labor and delivery in humans are unknown. The safety and effectiveness of zonisamide in children under age 16 have not been established. Cases of oligohidrosis and hyperpyrexia have been reported (see WARNINGS, Oligohidrosis and Hyperthermia in Pediatric Patients subsection). Zonisamide commonly causes metabolic acidosis in pediatric patients (see WARNINGS, Metabolic Acidosis subsection). Chronic untreated metabolic acidosis in pediatric patients may cause nephrolithiasis and/or nephrocalcinosis, osteoporosis and/or osteomalacia (potentially resulting in rickets), and may reduce growth rates. A reduction in growth rate may eventually decrease the maximal height achieved. The effect of zonisamide on growth and bone-related sequelae has not been systematically investigated. The most commonly observed adverse events related to treatment with zonisamide (an incidence at least 4% greater than placebo) in controlled clinical trials and shown in descending order of frequency were somnolence, anorexia, dizziness, ataxia, agitation/irritability, and difficulty with memory and/or concentration. Table 4 lists treatment-emergent adverse events that occurred in at least 2% of patients treated with zonisamide in controlled clinical trials that were numerically more common in the zonisamide group. In these studies, either zonisamide or placebo was added to the patient's current AED therapy. Adverse events were usually mild or moderate in intensity. Behavioral Abnormalities â€“ Non-Psychosis-Related: Infrequent: Euphoria. The abuse and dependence potential of zonisamide has not been evaluated in human studies (see WARNINGS, Cognitive/Neuropsychiatric Adverse Events subsection). In a series of animal studies, zonisamide did not demonstrate abuse liability and dependence potential. Monkeys did not self-administer zonisamide in a standard reinforcing paradigm. Rats exposed to zonisamide did not exhibit signs of physical dependence of the CNS-depressant type. Rats did not generalize the effects of diazepam to zonisamide in a standard discrimination paradigm after training, suggesting that zonisamide does not have abuse potential of the benzodiazepine-CNS depressant type. Human Experience: Experience with zonisamide daily doses over 800 mg/day is limited. During zonisamide clinical development, three patients ingested unknown amounts of zonisamide as suicide attempts, and all three were hospitalized with CNS symptoms. One patient became comatose and developed bradycardia, hypotension, and respiratory depression; the zonisamide plasma level was 100.1 mcg/mL measured 31 hours post-ingestion. Zonisamide plasma levels fell with a half-life of 57 hours, and the patient became alert five days later. Management: No specific antidotes for zonisamide overdosage are available. Following a suspected recent overdose, emesis should be induced or gastric lavage performed with the usual precautions to protect the airway. General supportive care is indicated, including frequent monitoring of vital signs and close observation. Zonisamide has a long half-life (see CLINICAL PHARMACOLOGY section). Due to the low protein binding of zonisamide (40%), renal dialysis may be effective. The effectiveness of renal dialysis as a treatment of overdose has not been formally studied. A poison control center should be contacted for information on the management of zonisamide overdosage. Zonisamide capsules are recommended as adjunctive therapy for the treatment of partial seizures in adults. Safety and efficacy in pediatric patients below the age of 16 have not been established. Zonisamide should be administered once or twice daily, using 25 mg, 50 mg or 100 mg capsules. Zonisamide capsules are given orally and can be taken with or without food. Capsules should be swallowed whole. The initial dose of zonisamide capsules should be 100 mg daily. After two weeks, the dose may be increased to 200 mg/day for at least two weeks. It can be increased to 300 mg/day and 400 mg/day, with the dose stable for at least two weeks to achieve steady state at each level. Evidence from controlled trials suggests that zonisamide doses of 100 to 600 mg/day are effective, but there is no suggestion of increasing response above 400 mg/day (see CLINICAL PHARMACOLOGY, Clinical Studies subsection). There is little experience with doses greater than 600 mg/day. Store at 25°C (77°F), excursions permitted to 15°-30°C (59°-86°F) [see USP Controlled Room Temperature], in a dry place and protected from light. Andheri (East), Mumbai - 400 059, India. Zonisamide capsules can have other serious side effects. For more information ask your healthcare provider or pharmacist. Tell your healthcare provider if you have any side effect that bothers you. Be sure to read the section titled "What are the possible side effects of Zonisamide Capsules?" What should I tell my healthcare provider before taking Zonisamide Capsules? Inactive ingredients: microcrystalline cellulose, hydrogenated vegetable oil, gelatin, and titanium dioxide. 100 mg: FD&C Blue # 1 and FD&C Red # 40.